Heart leaf raspberry is found is Himalayas from Pakistan to Sikkim. This plant usually grows wild in forests, ravines, stream sides from 1500 to 3200 m.
This raspberry has also been introduced to the United States. Heart-Leaf Raspberry is found in the Himalayas, from Pakistan to Bhutan, at altitudes of 1500-2900 m.
A paste of bark is used in the treatment of scabies. Leaf paste is used as a poultice on sprains. 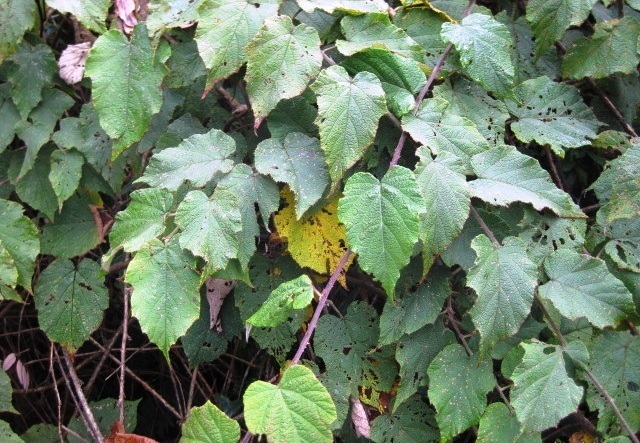 Shrubs scandent, to 3 m tall; branchlets brownish to reddish brown, terete, yellowish gray tomentose-villous, gradually glabrescent, with sparse, minute prickles. Leaves simple; petiole 2–4 cm, yellowish gray or gray tomentose-villous, usually unarmed; stipules oblong or ovate-lanceolate, to 8–11 mm, villous, margin laciniate lobed above middle, lobes linear; blade ovate to narrowly ovate, 9–15 × 6–10 cm, lateral veins 5–7 pairs, abaxially densely yellowish gray to gray tomentose, villous along veins or glabrescent, adaxially villous, more densely so along veins, base cordate, margin undulate or inconspicuously lobed, irregularly coarsely serrate to doubly serrate, apex acuminate. Inflorescences terminal or axillary, terminal ones cymose panicles, laxly spreading, 10–24 cm, axillary inflorescences smaller, subracemes; rachis and pedicels yellowish gray or gray tomentose-villous; bracts elliptic or oblong to lanceolate, 7–9 mm, villous, apex lobed or not divided. Pedicel to 1.5 cm. Flowers to 1.8 cm in diam. Calyx abaxially tomentose and villous; sepals ovate to lanceolate, 5–7 × 2–4 mm, apex acute to caudate-acuminate, outer sepals lobed, inner sepals entire. Petals white to yellowish white, oblong, 6–8 mm in diam. Stamens many, shorter than petals; filaments linear, glabrous. Pistils longer than stamens, glabrous. 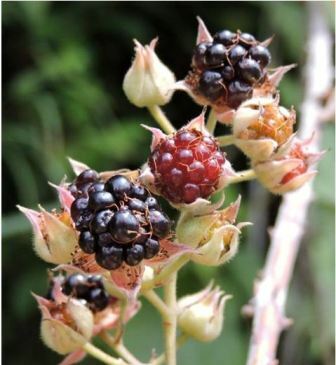 Fruits aggregate, dark red to blackish purple, globose, glabrous; pyrenes distinctly rugose. The fruits are edible and are eaten by local people. Their taste is a blend of sweet and sour. However, these fruits are not as tasty as those of Rubus ellipticus. The plant is said to have some medicinal uses too. A paste of the bark is used in the treatment of scabies. A paste of the leaves is used as a poultice on sprains. Heart shaped raspberry grows in wild only and has not been brought under cultivation yet. However, expert observations of this shrub indicate that it might be easy to grow this plant on well drained loamy soils in sun or semi shade. New plants can be raised from seed. The germination is enhanced if the seed is cold stratified at 3 C for a month.